Other frequently- hit slots jackpots overdue for a big win. 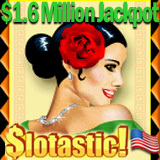 For U.S. players looking for the biggest online progressive jackpot games available, Slotastic.com reports that its Jackpot Piñatas slot machine jackpot is now over $1.6 million dollars, making it the richest slots jackpot open to American online casino players. While million dollar jackpots aren’t cracked very often, other smaller jackpots at the online casino designed especially for slots players frequently make large payouts. Jackpot Piñatas is a 5-reel 20-payline slot machine with festive Mexican images. In addition to the main seven-figure jackpot, there is also a generous secondary jackpot. The main jackpot pays out when five Bull Piñata symbols line up on any one line with a minimum $.25 bet on all 20 pay lines. Three or more Dog Piñata symbols trigger the Bonus Round with prizes up to 200x the original bet and lead to up to 25 free spins afterwards. Considered a "loose jackpot", the Let 'Em Ride jackpot has paid out fourteen times since it was launched and seldom goes more than three weeks without a $50,000+ win. Three games contribute to it -- Caribbean Stud, Caribbean Draw and Caribbean Hold ‘Em – so that jackpot also gets hit quite frequently for similar amounts. Since it is hit on average every three to four weeks, and it has now been more than a month, many players feel these games are overdue for a hit which explains its recent popularity. Jackpot Piñatas is the current Slot-of-the-Month at Slotastic, so until the end of October players can receive a deposit bonus of up to $100 for this game. The required coupon code for this bonus is POMPARTY. When asked what they would do if they won the 1.6 million dollar Jackpot Piñatas progressive jackpot, Slotastic players were practical and generous, but said they’d indulge themselves as well. Known for its massive jackpots, Slotastic.com is also famous for its daily slots tournaments and special “added money” tournaments like the upcoming Halloween Slots Tournament where they add $1000 to the prize pool. Tournament contestants can register and play anytime between now and midnight, October 31st. Current top scores are listed on the live leader board and the player at the top of the list at midnight on Halloween night wins the tournament. Slotastic.com is a full-featured online casino with games and promotions designed especially for online slots enthusiasts. It is the home of the largest online progressive jackpots available to American players and the best online slots tournaments.